The Dark Knight is a complex movie filled to the brim with parallel messages about society, politics, and the nature of man. There’s no shortage of endlessly debatable subtext in the film, but I’m pretty sure that the Joker wasn’t a stand in for Stalin. Yet that hasn’t stopped someone in Los Angeles from using the Joker’s viral marketing campaign to label President Obama as a socialist. 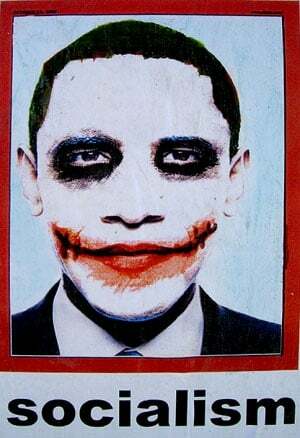 Their political message is clear, but I guess they missed the part of The Dark Knight where the Joker is an anarchist. He has more in common with Rush Limbaugh than he does Barack Obama. He’s not just opposed to big government, he’s opposed to all government. If there’s a socialist figure anywhere in The Dark Knight it’s Batman, who champions the cause of the people and believes in a society where everyone works together for the common good. I mean he’s basically Leon Trotsky in a cape and cowl. Someone scribble some bat ears on those posters. Let’s be accurate about this.